I have a severe backlog of other images to edit and post, but I couldn’t help myself and went ahead and edited a few photos from my recent trip to Jackson, Wyoming. The main reason for the trip was to ski, but I did get up early and stayed out late with my camera on a few occasions. 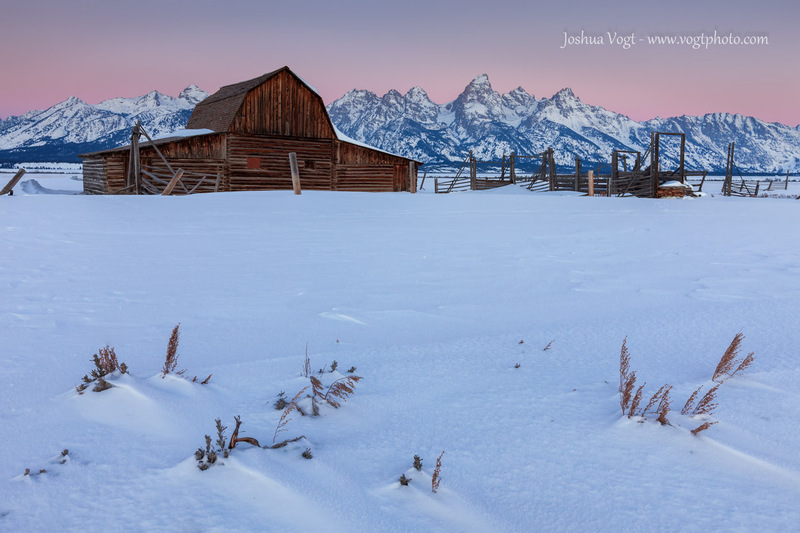 Jackson Hole is absolutely stunning any time of year, but the gigantic Teton Range covered in snow is an extra special site to see. 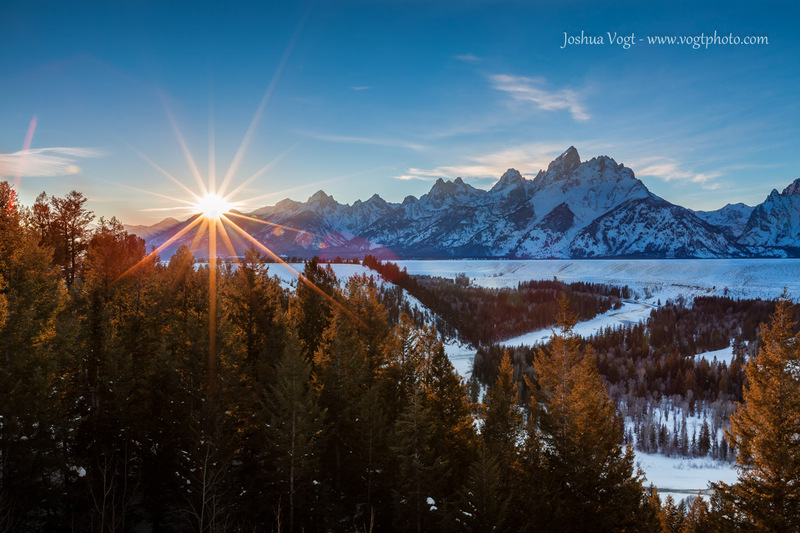 Another bonus of visiting Jackson Hole and Grand Teton National Park in the winter is that the crowd levels are way down compared to the summer and fall months. Driving in Thursday night, I noticed a full moon rise and looked at the moon set time and saw it would set near sunrise the next morning. So, I woke up early with high hopes for a great morning shoot. 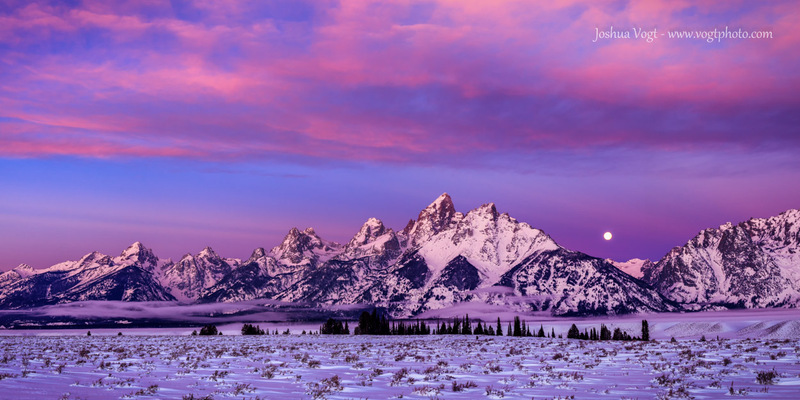 I drove north out of Jackson looking for a good composition of Grand Teton. I found a cool looking group of trees that would make a great foreground with “The Grand” behind and set up my camera along the side of the highway. I first made the panorama below when it was still quite dark out. A few minutes later, the scene exploded in color. I zoomed out slightly and included more of the pastel clouds, creating my favorite image of the trip. Amazingly, a few other photographers that were also parked along the road stopped shooting and loaded up their camera gear and drove off looking for a different spot during these precious few seconds of peak color! Yes, these first two images are very similar, but if I were in a hurry to get to the next spot, I would have missed this incredible moment. In landscape photography, sometimes it pays to be patient. The vibrant pinks and purples began to fade quickly, so I pulled out my wide angle lens and decided to focus on the sagebrush in the valley. The sage caused drifts and patterns and textures in the snow that I found interesting. 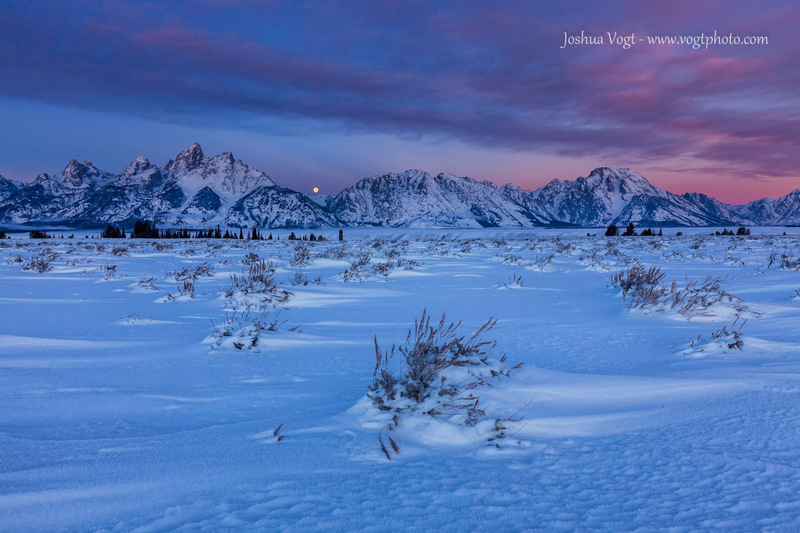 The moon still refusing to dip behind the Teton Range was a nice little bonus. Less than a minute after taking this image, the moon was lost behind the mountain ridges. At this point in the morning, I knew I had a few strong images, but wanted to explore the area a little more before heading off to Jackson Hole Mountain Resort to go skiing. I hopped in my truck and turned off the main highway at the Antelope Flats Road to scout out the often photographed Moulton Barns. 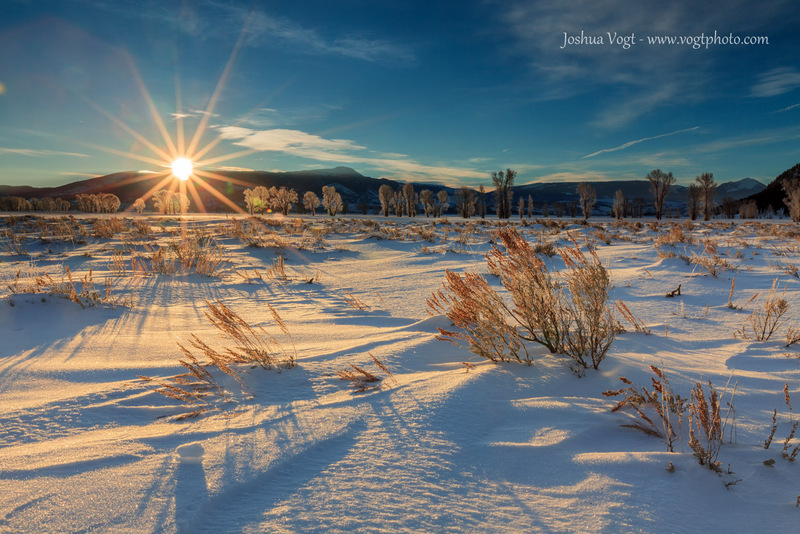 I parked at the winter road closure and while looking to see how far off the barns were, really liked the look of the buried grasses and sage as the sun cast its first direct light of the day on the valley floor. I couldn’t help but notice the frosted trees and how they appeared to sparkle with the low angled sunlight hitting them. I tried to shoot the back-lit trees (the trees right below the sun in the above picture), but my cheap-ish 70-300mm zoom lens is prone to really nasty flare when shooting directly at the sun. I ended up settling on shooting some trees that were still nicely lit, but not fully back-lit. After a hard day’s skiing at the resort, I set out to shoot sunset. After driving a while I decided to pull over and ended up at the Snake River Overlook. Ansel Adams made this viewpoint, along with the Tetons themselves nationally recognizable in 1942 with what would become one of him most recognized images. The trees in the foreground have grown much taller over the last 60+ years, but the view of the Snake River and the Tetons is still breath taking. I processed the first two images in this blog at the hotel in Jackson. When I showed them to one of my friends, he asked, “is that really what the sunrise was like?” I invited him to come along with me the next morning and find out for himself. Once again, I got up early, well before sunrise, and drove to the winter trail head for Mormon Row. We hiked the mile or so out to the Moulton Barns with just enough time to spare before the night sky gave way to pinks and purples of morning twilight. The sunrise was not nearly as spectacular as the morning a few days prior, but beautiful nonetheless. 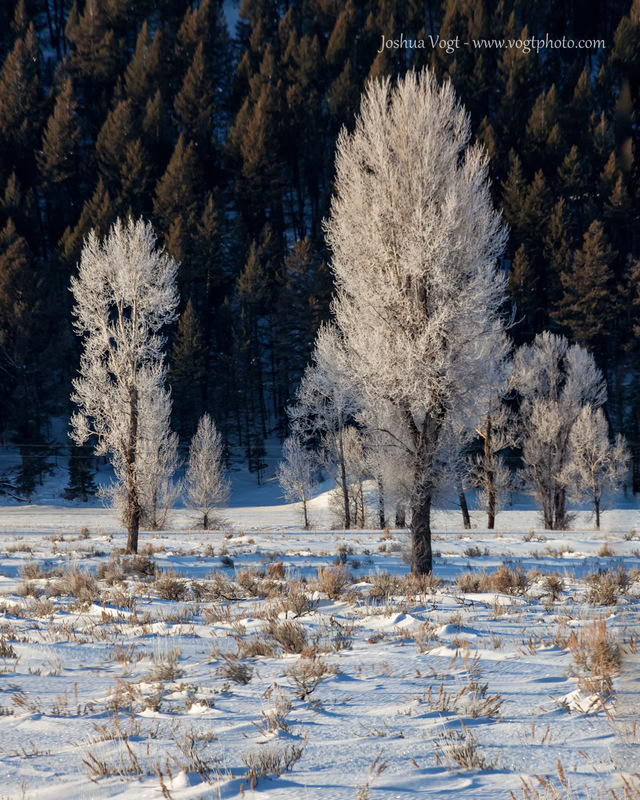 Jackson Hole and the surrounding area are truly a special place any time of year. I would practically cut off my left arm if it meant I could reside in this beautiful valley. For now, I will take thanks that I live in the same state as the Tetons and they are close enough to visit over a weekend. Wow….this place is magical and so beautiful. Excellent photos!